Video clip synopsis – A teacher at a call centre college in India takes students through some general knowledge about 'Downunder Australia'. Broadband MP4 capsule_bb.mp4 (5.0MB), suitable for iPods and computer downloads. 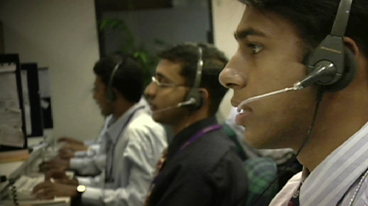 In this video clip see call centre trainees commute by motorbike to their call-centre training college in New Delhi. We then see a call centre training classroom. A teacher is taking post-graduate students through some general knowledge about 'Downunder Australia’ and is presenting iconic images to familiarise them with their customers’ country. An Australian businesswoman explains her goals in using call centre trainees for Australian wine sales. An 'Australian Culture Capsule’ is an excerpt from the documentary Diverted to Delhi produced in 2002. Diverted to Delhi is a Greg Stitt Production, developed in association with the Australian Film Commission and financed with the assistance of the Australian Film Finance Corporation. Produced with the assistance of the Australian Broadcasting Corporation. List the elements included in the 'Australian Culture Capsule’ presented to the students by the two teachers. What do you think of the 'Australian Culture Capsule’? Are the images reasonable or are they stereotypical? Do you think it is appropriate to include a copy of the film The Castle in this capsule? Think about the language and slang. Create a photo-story of your own ‘Australian Culture Capsule’ which depicts your family culture in Australia. Does it have any similarity with the one used in the call centre training in India? Share it in class. The Australian wine sales interviewee is pleased that her Indian employees telemarketing as Australians achieved very high sales. Is this ethical? Why? What values, or what inter-cultural understandings, should ideally underpin the actions of the operators of the companies out-sourcing telecommunications to India? Why? Refer to the Kahootz 3 Xpression titled, Pen Pal Exchange. Write a story about a memorable experience you have had and share this with your imaginary pen pal in India. Develop this story into a Kahootz Xpression of your own. Adiga, A, 2008, The White Tiger, P127-128 Atlantic Books, London. Curriculum Corporation, 2004, Think English, Speak English in Popular Publishing, Voices and Visions from India: Texts for the Senior English Classroom CD Rom. Curriculum Corporation, 2004, Crazy English in Visual and Performing Arts, Voices and Visions from China: Texts for the Senior English Classroom CD Rom.